My goal for March was to write TWO blogs. So here I am on March 30, 2016, trying to squeeze in one more quick blog post! I was asked by my neighbors to make a cake for their grandson’s first birthday. I was super excited when I heard the theme of Where the Wild Things Are! 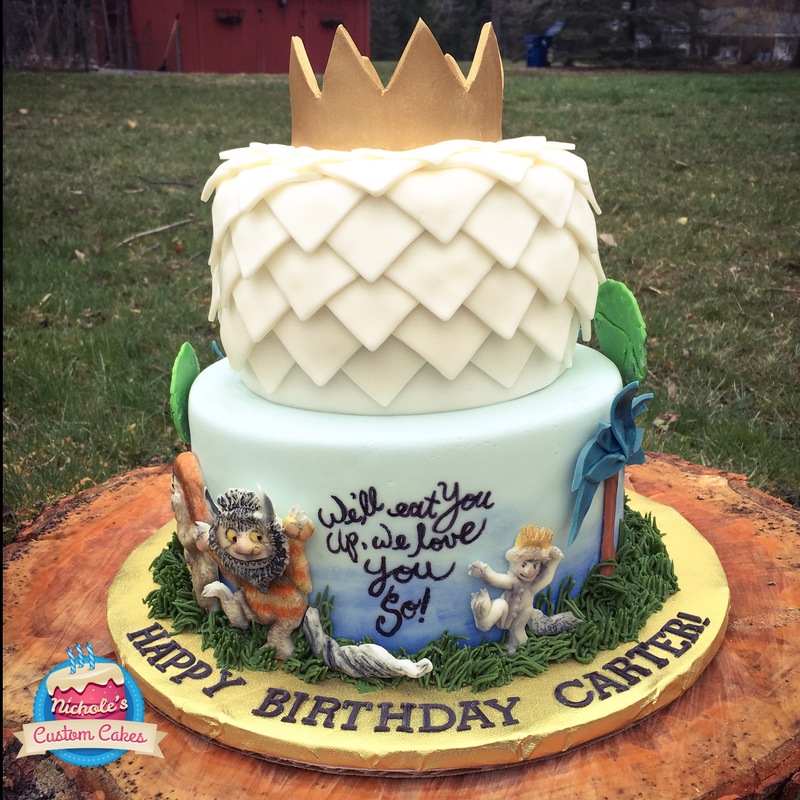 Over the years of following other people’s cake in my little bitty cake obsession, I have seen so many Wild Things Cakes. I had a lot of ideas, but in the end, I was asked to do a re-creation of a cake by Nashville Sweets. I was so happy to oblige! Isn’t it gorgeous? I had some other ideas, but they were in love with this design. Right away I came up with a plan on how to execute it myself. The first thing I decided to make were the characters and the crown, because they have to dry. I didn’t want to do an exact copy, and I have my own way of doing things with my characters. I wanted them to jump out of the picture. And I wanted to do my trees a little differently. I am also working on a Doc McStuffins project. After my gumpaste/fondant characters were all dried, I added details with food coloring and black edible dust. I really followed the book as closely as I could. After my crown was dried, I painted it with a mixture of gold dust and vodka. For this cake, we went with 8″ chocolate chip cake and 6″ sour cream cake with chocolate filling. Since I had to do writing on the cake, I knew it had to be covered in fondant. I made a fresh batch of LMF fondant. I have my charts for fondant amounts printed out, so figuring out how much fondant I needed for each cake was easy. I just measure out what I need in ounces on my kitchen scale and go from there. I usually round up because it is better to have too much rather than too little, plus you can save the extra fondant. I made some simple ganache and let it sit for 24 hours until it was the right consistency. Thick, not thin. For two 3-layer cakes, I needed a lot of ganache. I heated 1,000 ml of heavy cream and added it to 1,000 grams of chocolate chips. After my cakes were room temperature, I filled and covered them. I let them rest in the fridge for a few hours. Then it was time to cover them in fondant. I use my table rather than the counter because it’s nice and low. I can really use my body weight and gravity to roll my fondant out nicely. I moisten my cake with a little bit of water so that the fondant adheres to my cakes. I use Jessica Harris’ trick of flipping my cake upside down to get great, sharp edges. I know that sounds scary, but it really works! After that, I was done for the day! I put my cakes back into the fridge. 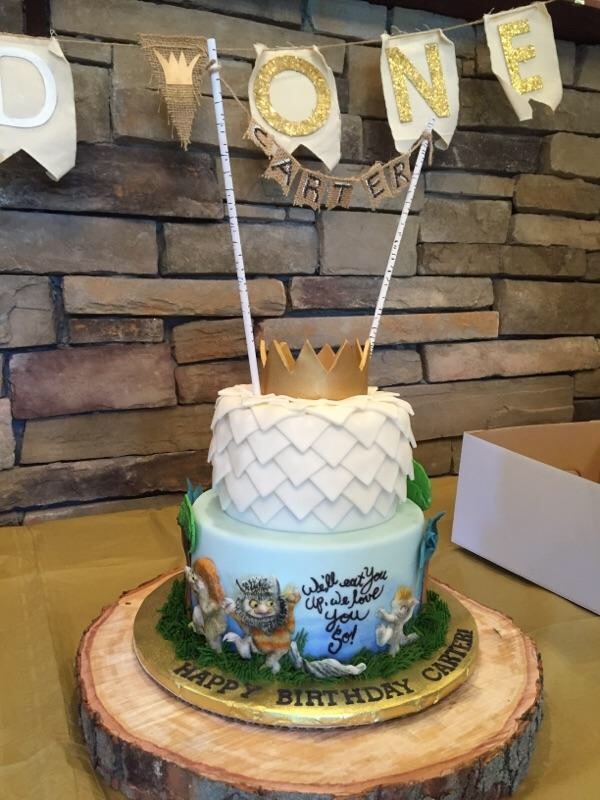 Before I started, I attached my 8″ cake to my decorated cake board. It’s a 12″ gold drum. The next thing I had to do was cut my dowel rods and stack my cakes. I used five small dowel rods in the bottom and one long dowel rod down the center. I didn’t like the gap between the cakes, so I made a strip of white and wrapped it around the bottom to give it a clean look. After it was all fixed, I was ready to start the bottom tier. I needed to add the words “We’ll eat you up, we love you so.” I closely followed the original picture and tried to make a paper transfer. Unfortunately, it didn’t work! So I had to get my AmeriColor black gourmet writer and free hand it. Luckily, it turned out great! After that, I had to pipe on some grass with some decorator’s buttercream tinted with Wilton Moss Green. Then I was able to stick on the characters and the trees using some white buttercream as glue. When they were all placed, I added more grass. Then I added the birthday message in the front of the cake (HAPPY BIRTHDAY CARTER). The stacking to the letters took about 2 hours. I put the cake away until that night. Decorating the top of the cake was very easy. I took my cake out of the fridge and was able to sit at the table. I had to make scales/feathers using my square cutter. I started at the bottom and worked my way up to the top. This took about an hour, which was longer than I had anticipated! While the fondant was still soft, I pushed my crown down onto the top. I was done! The next day, I quickly took my cake outside for a picture. I placed it on a huge stump that we have in the backyard. I was sure to put an extra board between the stump and the cake’s actual board. It was an overcast day, but I love how the picture turned out! We had a bit of a misunderstanding about the topper. I thought that my customer was buying it separately. But, luckily, I had the materials for such a topper lying around. It took about 15 minutes, but I made it! We also quickly made a cake stand using some stumps that we have lying around! It looked great with their whole Where the Wild Things Are display. My customer loved her cake and didn’t want to cut it! That’s the best feeling ever! But, as you know, we can’t keep cakes forever. They loved the taste of their custom cake. Everybody had their own favorite flavor. I’m so happy that I have another happy customer while doing with I love!